Desiring the Rain: You can do it! 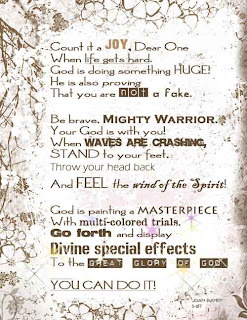 Sometime ago I found this poem on Beth Moore's site. I think is was written by Joan Bandy. Today I felt the words soothing to my soul, I pray that you also will feel the wind of His Spirit. As a little girl, I always dreamed of being a princess. In my late teens I became one, a true princess of The True King when He adopted me. I am the wife to my great hubby of 28 years, a mom to two wonderful boys and a woman that loves to seek God's Word and share it with others.